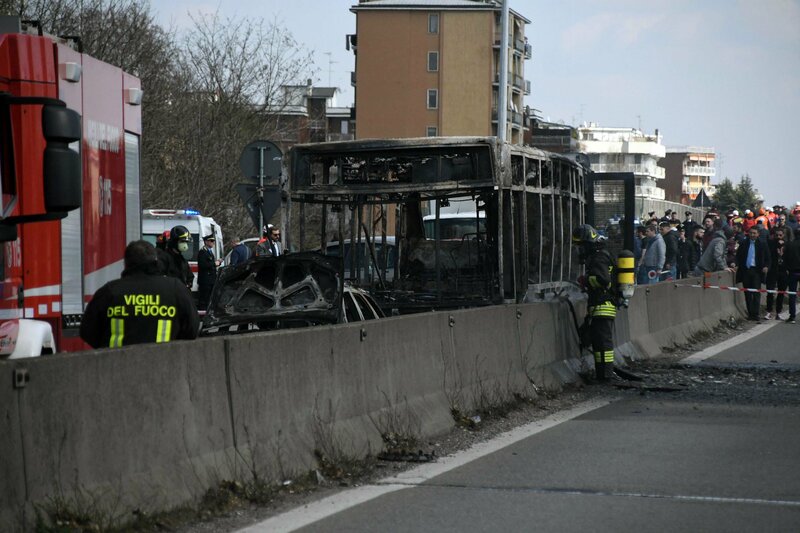 MILAN — A bus driver in northern Italy abducted 51 children and their chaperones Wednesday, ordering the children’s hands to be bound and threatening them with death during the 40-minute ordeal, before setting the vehicle on fire when he was stopped by a Carabinieri blockade. Officer broke glass windows in the back of the bus and got all the passengers to safety without serious injury before the flames destroyed the vehicle, authorities said. As he was apprehended, the driver said he was protesting migrant deaths in the Mediterranean, Commander Luca De Marchis told Sky TG24. De Marchis told Sky TG24 that the driver, an Italian citizen of Senegalese origin in his 40s, threatened the passengers, telling them that “no one would survive today” as he commandeered the bus carrying two middle-school classes to a nearby gym in Cremona province, some 40 kilometers (25 miles) from Milan.